It’s the best meal of the year, complete with turkey and stuffing (Or if you are like my husband, “dressing”. ), mashed potatoes, green bean casserole, sweet potato casserole, rolls, and the list goes on. YUM! But let’s not get too ahead of ourselves, because if your family is like most you have a few traditions at your table before the turkey is sliced. First is the prayer and second is the time for everyone around the table to take a turn and say what they are most thankful for this year. Now, if you are anything like me, I don’t really take this tradition seriously. I mean, it is torture just sitting there, starring at all that food and not being able to eat it. And while most people just speed through this time of thanks saying the first, most general thing that comes to mind like “family”, “the roof over my head”, or “our freedom”, I have found it rare to hear anyone give thanks FOR the One who gave them all this stuff to begin with. Now, I raise my hands. I am just as guilty as the next person. This time of year, I am really good at giving thanks TO God for all that He has done for me, but somehow amidst all the stuff, I often forget to give thanks FOR God who blesses me daily. Perhaps it is because saying, “thanks” for the things we see, and the things that are tangible is easier. Just like my children, who spend countless minutes during their prayers at bedtime thanking God for every family member, friend, toy, and event from the day, it is often easier for us to give thanks for the physical things we see as well. And as much as I wanted to get frustrated with her, I couldn’t help but to reflect in that moment and wonder when the last time was that I spent time thanking God just for Him in my prayers- not for my stuff and not for the things He has done for me, but FOR Him and Him alone. Embarrassingly enough, I couldn’t remember. This Thanksgiving I want to change that. This Thanksgiving, I want to re-teach myself and teach my children to be thankful FOR God. This year, as we go around the table giving thanks, I don’t simply want to focus on our physical blessings (although I still want to thank God for those), but I want to focus more on our God. 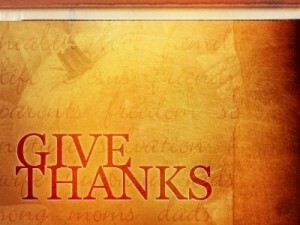 I want to “give thanks for the LORD, for He is good; his love endures forever” (Psalm 106:1). I want to give Him thanks and praise His glorious name (1 Chronicles 29:13). I want my heart to leap for joy and sing songs of thanksgiving to Him (Psalm 28:7). This Thanksgiving, I want to be thankful FOR God above anything else. And this Thanksgiving, I am encouraging you in the same way. God loves to bless us with so many things like our family, friends, our homes, education, and all of our stuff. But before He gave us any of that, He gave us Himself. And so this Thanksgiving let us all acknowledge Him above all else. Let us lift us His name and praise Him for just being Him. He has been so good to us, all of us. Let us not forget to tell Him how thankful we are FOR Him this holiday season while also being thankful TO Him.